A little-known Canadian data firm ensnared by an international investigation into alleged wrongdoing during the Brexit campaign created an election software platform marketed by Cambridge Analytica, according to a batch of internal files obtained exclusively by Gizmodo. Discovered by a security researcher last week, the files confirm that AggregateIQ, a British Columbia-based data firm, developed the technology Cambridge Analytica sold to clients for millions of dollars during the 2016 US presidential election. Hundreds if not thousands of pages of code, as well as detailed notes signed by AggregateIQ staff, wholly substantiate recent reports that Cambridge Analytica’s software platform was not its own creation. What’s more, the files reveal that AggregateIQ—also known as “AIQ”—is the developer behind campaign apps created for Texas Senator Ted Cruz and Texas Governor Greg Abbott, as well as a Ukrainian steel magnate named Serhiy Taruta, head the country’s newly formed Osnova party. Other records show the firm once pitched an app to Breitbart News, the far-right website funded by hedge-fund billionaire Robert Mercer—Cambridge Analytica’s principal investor—and are currently contracted by WPA Intelligence, a US-based consultancy founded by Republican pollster Chris Wilson, who was director of digital strategy for Cruz’s 2016 presidential campaign. A screenshot shows an AIQ developer working on code for Cambridge Analytica’s Ripon software in August 2015. A screenshot shows an AIQ developer working on code for Cambridge Analytica’s Ripon software in September 2015. The files were unearthed last week by Chris Vickery, research director at UpGuard, a California-based cyber risk firm. On Sunday night, after Gizmodo reached out to Jeff Silvester, co-founder of AIQ, the files were quickly taken offline. The files are likely to draw the interest of investigators on both sides of the Atlantic. Canadian and British regulators are currently pursuing leads to establish whether multiple “Leave” campaigns illegally coordinated during the 2016 EU referendum. 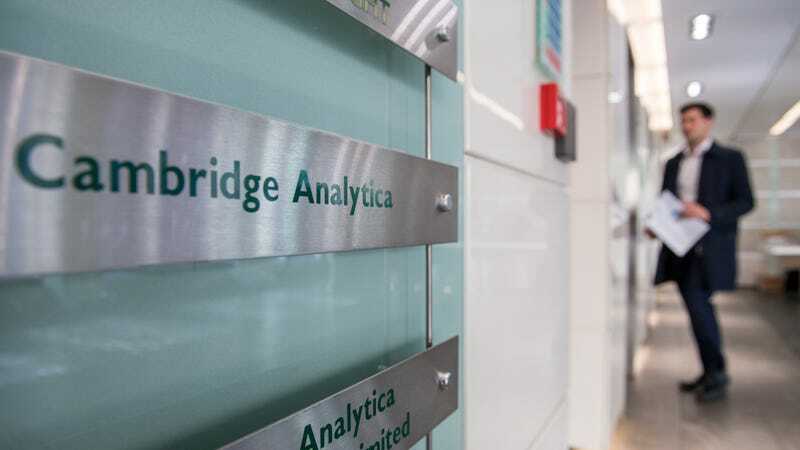 Ties between AIQ and Cambridge Analytica—the focus of recent widespread furor over the misuse of data pulled from 50 million Facebook accounts—has likewise drawn the interest of US and British authorities. Cambridge CEO Alexander Nix was suspended by his company last week after British reporters published covertly recorded footage showing Nix boasting about bribing and blackmailing political rivals. Cambridge Analytica did not respond to a request for comment. AIQ is bound by an non-disclosure agreement the company signed in 2014 to take on former client SCL Group, Cambridge Analytica’s parent company, according to a source with direct knowledge of the contract. In an interview over the weekend with London’s The Observer, Christopher Wylie, the former Cambridge Analytica employee turned whistleblower, claimed that he helped establish AIQ years ago in an effort to help SCL Group expand its data operations. Silvester denied that Wylie was ever involved on that level, but admits that Wylie helped AIQ land its first big contract. UpGuard first discovered code belonging to AIQ last Thursday on the web page of a developer named Ali Yassine who worked for SCL Group. Within the code—uploaded to the website GitHub in August 2016—are notes that show SCL had requested that code be turned over by AIQ’s lead developer, Koji Hamid Pourseyed. AIQ’s contract with SCL, a portion of which was published by The Guardian last year, stipulates that SCL is the sole owner of the intellectual property pertaining to the contract—namely, the development of Ripon, Cambridge Analytica’s campaign platform. The find led UpGuard to unearth a code repository on AIQ’s website. Within it were countless files linking AIQ to the Ripon program, as well as notes related to active projects for Cruz, Abbott, and the Ukrainian oligarch. A mockup of a “meme generator” being developed by AIQ for Texas Gov. Greg Abbott’s phone app. The Database of Truth, according to the wiki, is a project under development for WPA Intelligence. Until recently, Cambridge Analytica operated largely in the shadows. For years, it planned to target right-leaning voters for a host of high-profile political campaigns, working for both Cruz and President Donald Trump. With its billionaire backing, the firm promised to leverage oceans of data collected about voters—which we now know was acquired from sources both legal and unauthorized. Cambridge Analytica, which eventually chose AIQ to help build its platform, once boasted that it possessed files on as many as 230 million Americans compiled from thousands of data points, including psychological data harvested from social media, as well as commercial data available to virtually anyone who can afford it. The company intended to classify voters by select personality types, applying its system to craft messages, online ads, and mailers that, it believed, would resonate distinctively with voters of each group. AIQ’s internal files show the company had unlimited access to the Ripon code, and a source within the Cruz campaign confirmed to Gizmodo that AIQ was solely responsible for the software’s development. According to the aide, when Cruz’s staff began to question AIQ over whether it was behind Ripon’s development, AIQ confirmed that it was, but said it was never supposed to discuss its work. In 2016, Mercer reportedly offered up Cambridge Analytica’s services for free to Leave.EU, one of several group urging the UK to depart the European Union, according to The Guardian. Leave.EU was not, however, the official “Leave” group representing the Brexit campaign. Instead, a seperate group, known as Vote Leave, was formally chosen by election officials to lead the referendum. Whereas Leave.EU relied on Cambridge to influence voters through its use of data analytics, Vote Leave turned to AIQ, eventually paying the firm roughly 40 percent of its £7 million campaign budget, according to The Guardian. Over time, however, Vote Leave amassed more cash than it was legally allowed to spend. While UK election laws permitted Vote Leave to gift its remaining funds to other campaigns, further coordination between them was expressly forbidden. Roughly a week before the EU referendum, Vote Leave inexplicably donated £625,000 to a young fashion design student named Darren Grimes, the founder of a small, unofficial Brexit campaign called BeLeave. According to a BuzzFeed investigation, Grimes immediately gave a “substantial amount” of the cash he received from Vote Leave to AIQ. Vote Leave also donated £100,000 to another Leave campaign called Veterans for Britain, which, according to The Guardian, then paid AIQ precisely that amount. A review of the AIQ files by UpGuard’s Chris Vickery revealed several mentions of Vote Leave and at least one mention of Veterans for Britain, apparently related to website development. In an interview on Monday, Shahmir Sanni, a former volunteer for Vote Leave campaign, told The Globe and Mail that he had “first-hand knowledge about the alleged wrongdoing in the Brexit campaign.” Sanni, who was 22 when he worked for Vote Leave, said he was “encouraged to spin out” another campaign, but that he had “no control” over the £625,000 that was immediately spent on AIQ’s services. In an email, the UK Election Commission told Gizmodo its investigation into Vote Leave payments was ongoing. “All of the direction for BeLeave came from BeLeave and all of the direction for Vote Leave came from Vote Leave,” AIQ’s co-founder told Gizmodo.